Oil had been mined by hand near the banks of the Irrawady at Yenangyaung (94.87E 20.46N) for centuries, but in 1887 the British began modern exploitation of the field. Production was 4.1 million barrels in 1940. Battle of Yenangyaung. Following the fall of Rangoon, the British attempted to hold northern Burma using motorized forces fueled from Yenangyaung. 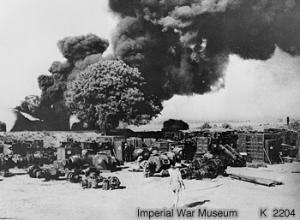 However, the Japanese gradually forced back the British, and Slim was forced to order the destruction of the production facilities on 14 April 1942. Elements of 33 Division infiltrated through the gap between 17 Indian Division and 1 Burma Division and could not be driven off by 48 Indian Brigade. Slim believed that 17 Indian Division should have been pulled back, but Alexander refused permission for fear of the effect on the Chinese. The entire Burma Corps was now trapped by a battalion of 214 Regiment, which set up two roadblocks across the road into Yenangaung on 16 April. After much vacillation, Chiang Kai-shek ordered a counterattack by 38 Division (Sun) that extricated 17 Indian Division but was unable to relieve the British at Yenangyaung. 1 Burma Division was forced to break out on the night of the 19th, leaving behind their wounded in ambulances and most of their heavy equipment. A British officer who volunteered to return at night and check on the wounded found that all had been bayoneted or had their throats cut. 38 Division finally broke into Yenangyaung on 20 March, long after the British had broken out, but inflicted heavy casualties on the Japanese. Slim saw no further point to attempting to hold the town and ordered 38 Division to withdraw before it was destroyed. Slim was sufficiently impressed by its performance to push for 38 Division to withdraw into India rather than back into China. The Japanese were slow to repair the oil field following its capture. When the finally began a serious effort to recondition the field in late 1943, the Allies responded with a series of raids to disrupt the repair work. However, the Japanese Army in Burma had modest enough fuel requirements that even the resulting drop in production from 5000 gallons of gasoline per day to 1680 gallons per day in the production capacity had little effect on their military operations. Yenangyaung was recaptured by the British in February 1945.